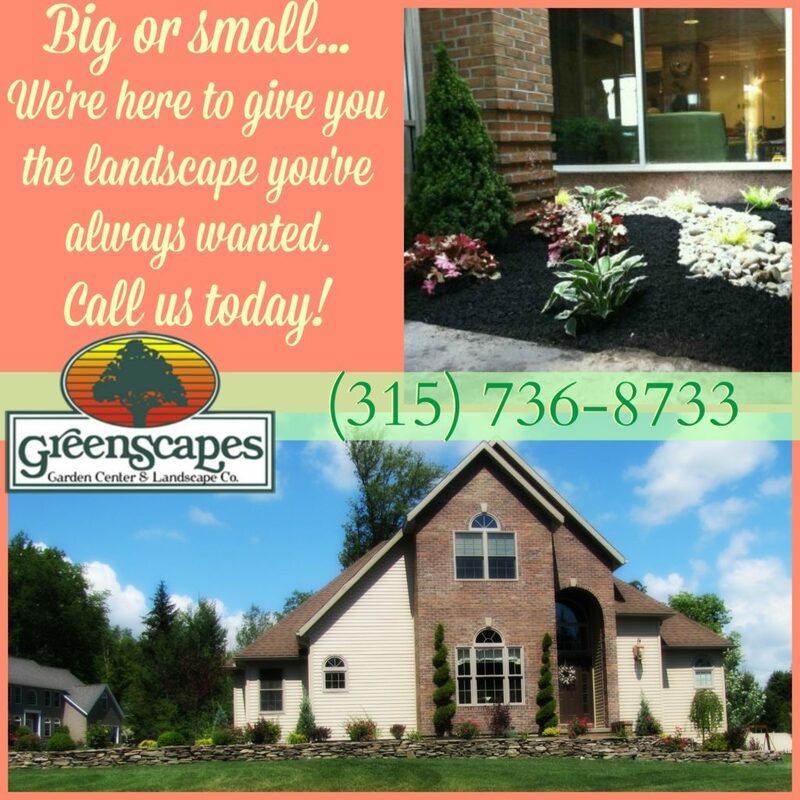 Landscaping - GreenScapes Garden Center & Landscape Co. Whether you want to do all the planting yourself or you would rather a professional complete the job, consider the following options for your new landscape. 2.) Once we have the pictures and dimensions, a design will be drawn to include your home and future foundation planting. 3.) Along with the design, a proposal will be completed including planting fees, labor, plants, and material costs. 4.) When the design and proposal are complete, you will be notified to come to GreenScapes and look around at what we have suggested for you and any necessary changes can be made. Our knowledgeable sales associates would love to walk you through the design and answer any questions you may have. 5.) As soon as a design is agreed on, the proposal is signed and the landscape installation can begin. *Please understand that our schedule fills up quickly - you will be given an idea of when your job will begin upon signing your proposal. You will be notified prior to the start of the job to confirm a planting date. This simple questionnaire will help you make the most of your consultation. The goal of the questionnaire is to help us best understand your needs. Within the packet, there are questions to answer, a Sample Site sheet to draw your dimensions, and a spot to attach some photos. General dimensions help us determine how many and what plants will work in your area. As far as the photos go, the more the better. The more views we have of your home, the better we can understand your property. The best photos for us to work with are shots that are straight on of your home. Within the packet there is a section for you to tell us what your favorite plants are. If you do not know what plants you think you should use, grab a clipboard and some paper and just wander around the Garden Center. Whether or not you think some plants would work, just write them down if you like them; we can tell you if the plant is suitable for your site. Of course, it is your area that you have to look at everyday; you should have the plants you enjoy! Any other notes are important too. If you have drainage issues, or deer and rabbits in the area, or you get a lot of snow and ice falling off of your roof; the more information you tell us, the better. On another note, if there is anything that you would like to see in your landscaping; such as retaining walls, sidewalks, bird baths, fences, and so on; we can include these things in your images. Your satisfaction is our number one concern. Creating a landscape you can live in is a fun, creative process. Whether it is in front of your house, a perennial garden in the back yard, some plants around the pool or gazebo for privacy, or just an island in the front yard, we can give you some great ideas. Please let us know when you are ready to start your project. Once you purchase the program, it may take up to 2-3 weeks to complete the design. Please understand that this process is on a first come, first serve basis. If you have a date that you would like your project completed by, please let us know as soon as you can. * This packet is $75, and comes with a $75 gift card for you to use on your upcoming project upon completion of the design. When the design is complete, we will notify you and go over every aspect of the project including plants, watering and sunlight needs, and planting procedures. If changes need to be made, we can work with you so can see what your possibilities there are for your project. If no changes are needed, you can start choosing plants and working on your project! *Please note: all landscape designs may take up to 2-3 weeks to complete. Due to the large amount of designs to complete, please be patient. If you have a time constraint, please let us know before we begin your project. Spring & Fall landscaping are very popular - so make your appointment early! 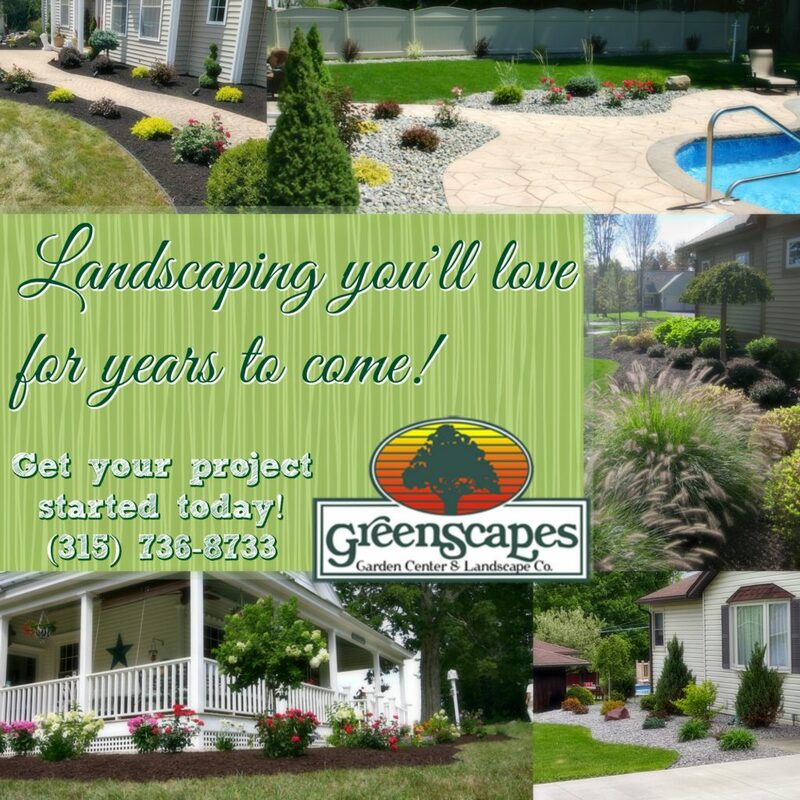 GreenScapes has been proudly landscaping the Mohawk Valley for over 25 years. Landscaping your home not only makes it look more appealing, it also may help your finances in the long run. There are several benefits that come from a nicely landscaped home. A study by the American Nursery and Landscape Association found that beautiful landscapes can increase property value by seven to 14 percent and can accelerate the sale of a home by five to six weeks. Moreover, experts believe that homeowners can recover as much as 100 percent of the money they invested in cultivating landscapes when they sell their homes at higher values. Landscaping can cause more energy efficiency. According to the U.S. Department of Energy, carefully positioned trees can cut as much as 25% off a household's energy consumption for heating and cooling. Additionally, well-designed landscapes provide enough energy savings to return the initial landscaping investment in eight years. Landscaping can help decrease heat buildup in the home by blocking and absorbing the sun's energy in the summer, while trees and hedges can be used as windbreaks to shield a house from wind chill during the winter. Blooming landscapes enhance a property's aesthetic value and create a desirable living environment. Captivating landscapes provide a shelter of serenity and calm against an outside world that is subdued by noise and haste. You spend a good part of the day running around. Don't you want to come home to a solacing house framed by sturdy trees, colorful blooms, and cozy deck chairs and nestled within welcoming landscapes that smell of freshly cut grass? Landscapes that celebrate the beauty of nature in all its vibrant hues comfort the soul and reinvigorate the senses. Deciduous trees, sprouting blossoms, and hardy perennials in lush landscapes offer a glimpse of rejuvenation.